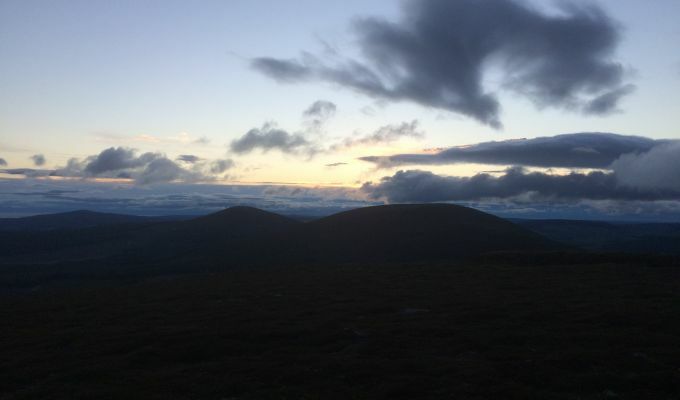 I ALWAYS get nervous before taking a group out on the hills for a midnight walk for one simple reason - the weather. When I go out on my own, I can always cancel at the last minute if the conditions aren’t right and re-schedule for a better night. You can’t do that when you are committed to a fixed date, so the days before any planned event are spent watching the skies and the forecasts. It was the same again last weekend. Myself and mountain rescue legend David ‘Heavy’ Whalley were leading a party to the summit of Ben Rinnes as part of the Moray Walking and Outdoor Festival programme. This is the festival’s fifth year, and although this is not an area of big mountains, the sheer diversity of the programme and the passion of the people who put it together ensure it is a success. It runs for 11 days and provides something for everyone, from nature trails and botany outings to history walks and harbour circuits, from canyoning and white water rafting to beach walks and long-distance trails. It’s a big deal here and it’s getting bigger every year. I had been in Elgin on the opening night as a guest speaker and the rain just kept coming. When I left next morning it hadn’t let up. I was beginning to fear for the Ben Rinnes walk. I must admit I take it personally: I always feel bad for those who have paid for the sunrise experience only to be faced with a four-hour slog up dark slopes in mist and rain with no prospect of any light at the end of the tunnel. I feel, somehow, that it’s my responsibility. It did clear on Friday and Saturday was lovely but then it was going downhill again on the Sunday. There was a glimmer of hope that it would clear through by about 2am so we decided to throw the starting time back by an hour at least to try to catch some decent weather. My evening drive up the A9 was under dark clouds and limited visibility, the rain beating down relentlessly. 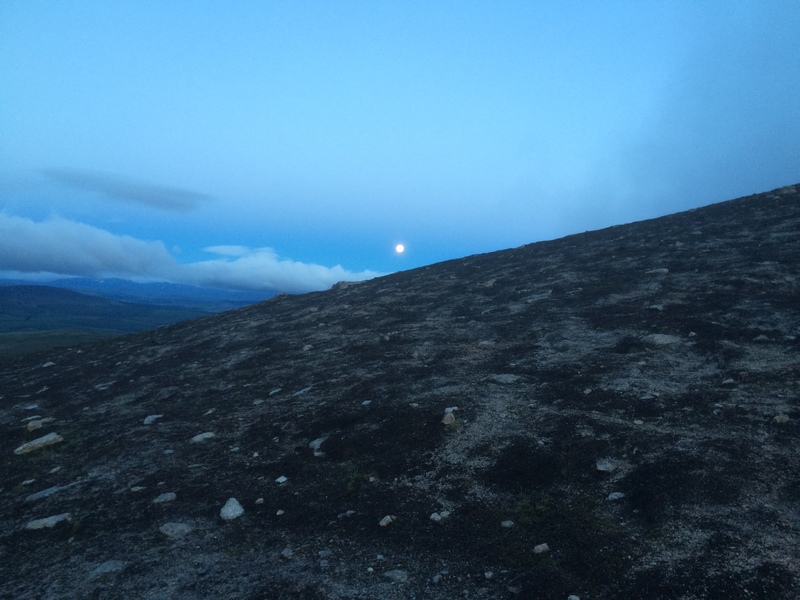 Then, as I approached Aviemore, the monsoon eased and the moon appeared in full, pushing through the clouds. The further inland I went, the drier it became. I could see the tops of the mountains, the lower reaches taking on a dreamlike nature with waves of cloud sloshing around the contours like mercury. We had suggested a 1.30am start, but everyone had arrived early so we set off, a line of head torches bobbing up the track. Just 40 minutes in and the moon appeared again, illuminating the way. There was an incredible variety of cloud formations no matter which way you looked. At one point as we climbed into the mist higher up, it looked as though there was another massive mountain behind us, a perfect conical cloud playing tricks. The wind at the summit was fierce and the view non-existent. We dropped down for shelter to wait it out, sunrise still an hour or so away. The moon was pulsating now, shining then fading then shining again, a constant battle with the rolling mists. 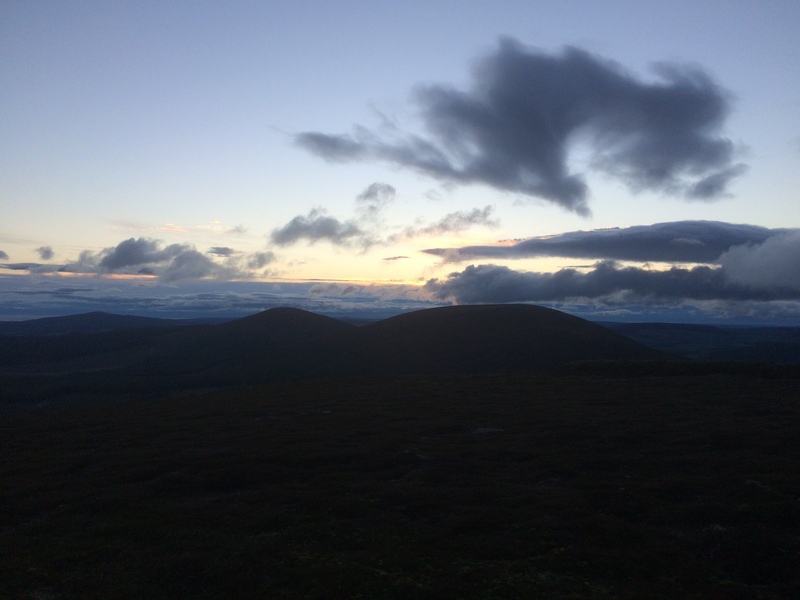 We enjoyed a dram of Ben Rinnes whisky and some tales of the mountains from Heavy before eventually deciding to drop out of the mist and wind to catch the sunrise further down. It arrived incognito but the clouds were beautifully lit from below, a golden streak spreading across the horizon with whispy spaceships dotting the sky, an ethereal alien invasion fleet. Everyone arrived back at the car park sated, a satisfaction in a job well done and a feeling of triumph that we had beaten the weather. This mood was further enhanced by the sight of Diane, one of the festival organisers, waiting there with coffee and bacon rolls. Breakfast at 5.15 with the sun now fully awake. The consensus was a job well done. I suspect it's the first of many good nights to come in Moray.